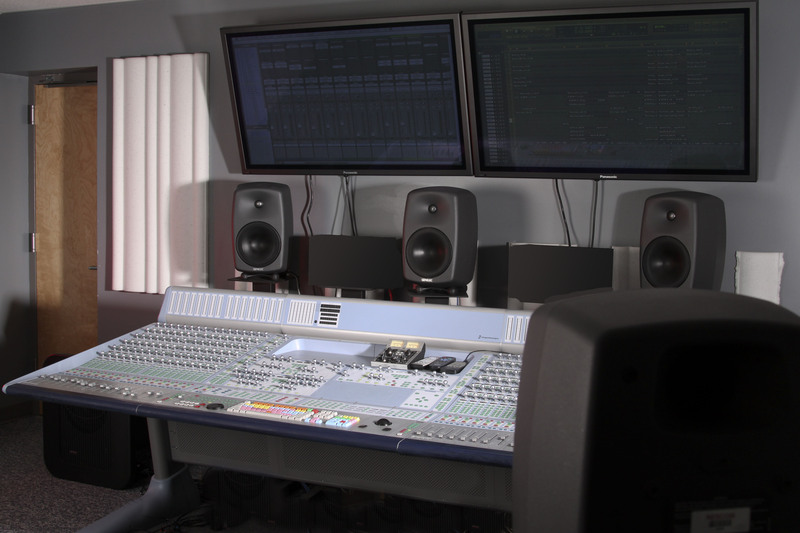 The New England School of Communication’s surround mixing control room, featuring three Genelec 8250A Bi-Amplified DSP Monitors for the L-C-R array, a pair of Genelec 8240A Bi-Amplified DSP Monitors for the surrounds and a Genelec 7270A Active DSP Subwoofer. NATICK, MA, December 15, 2009 — The New England School of Communication (NESCom) opened in 1981 with a mission to train students for careers in the broadcasting and related fields. Though it may be approaching its 30th anniversary, NESCom has kept its teaching technology at the cutting edge all of that time. This is clearly illustrated by the recent upgrade of the monitoring in NESCom’s surround mixing control room to a Genelec 5.1 system consisting of three 8250A Bi-Amplified DSP Monitors for the L-C-R array, a pair of 8240A Bi-Amplified DSP Monitors for the surrounds and a 7270A Active DSP Subwoofer. The upgrade was recently completed, and included a DSP monitor seminar to NESCom students this fall. The 5.1 mixing studio at NESCom had been in need of a monitoring upgrade, and Dave MacLaughlin, Executive Director of NESCom’s 4-year Audio Engineering Bachelor of Science degree program, says he was looking forward to it. “5.1 surround audio is a huge part of the professional audio industry, and we knew we needed to keep our 5.1 monitoring at as high a level of quality and accuracy as possible, which is why we went with Genelec,” he explains. The Genelec 8250A and 8240A bi-amplified compact DSP monitors are ideal in applications where a wide frequency response is needed but space is limited, and feature a flow-optimized reflex port that provides solid, clear and articulated low frequencies without compression, distortion or port noises. Combined with the advanced Genelec Directivity Control Waveguide™ (DCW™) and the rounded edges and gently curved front and sides of the MDE™ (Minimum Diffraction Enclosure™) enclosure, the result is an astoundingly flat frequency response both on and off axis. Other benefits include superb imaging precision and minimum listening fatigue. The Genelec Loudspeaker Manager (GLM™) control network and software enhances further the performance of the 8250A and 8240A: it features adjustment of levels, distance delays and flexible room response improvement equalization with the reliable and robust AutoCal automated calibration system via the GLM control network. Both the 8250A and 8240A offer both analog and AES digital inputs. The Genelec 7270A subwoofer is part of Genelec's 7200 LSE™ Series active subwoofers. The amplifier unit integrated into the cabinet contains active DSP crossover filters, driver overload protection circuits and a power amplifier. The LSE Series feature the Genelec Laminar Spiral Enclosure™ bass reflex cabinet that is made of a sheet metal rolled into a spiral shape and clamped between thick MDF side panels. This new construction technique provides excellent laminar flow characteristics with minimal turbulence noise and enables an optimal packing of a very long reflex tube into a small space. With their four AES/EBU digital inputs and outputs the 7200 subwoofers provide the cornerstone for digital monitoring room environments. Photo Caption: The New England School of Communication’s surround mixing control room, featuring three Genelec 8250A Bi-Amplified DSP Monitors for the L-C-R array, a pair of Genelec 8240A Bi-Amplified DSP Monitors for the surrounds and a Genelec 7270A Active DSP Subwoofer.